"The Swordfish" is the 16th Mandrake filler page, the 1st in between the 16th and 17th Sunday story. The story was written by Lee Falk and drawn by Phil Davis. This two pages is a strange sequence in history more like an additional independent event at the end of the previous story. First row ending the previous story, next row planning trip to Amoz Island. 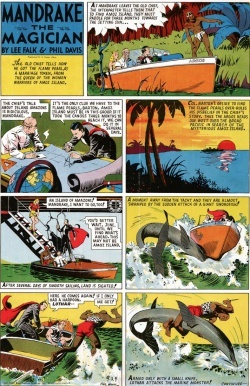 Then the swordfish attack and Lothar fights it on the last row and almost the whole next page, ending with a picture for the next story (Next Week: - The Amazons). Mandrake is on a scientific expedition to the South Pacific, looking for flame colored pearls. Heading the Amoz island a giant swordfish suddenly attack the Argos barge. This page was last edited on 25 May 2016, at 05:56.